My mother more or less raised me vegetarian. I say more or less, because we rarely ever ate meat at home. The only time we ate meat as a family was when we were out and about; meaning that we would be out grocery shopping in a nearby town, and would stop at Burger King for a chicken sandwich on the way home. The funny thing about my mom is that chicken was the only kind of meat she would allow us to eat, and it was only consumed from a fast food chain like Burger King– oh, and the odd chicken hot dog. Generally we ate really well as kids, but like any parent, enough nagging for a greasy burger would make my mom give in once in a while. McDonalds had a bad reputation even when I was a small kid, so we never ate there. My dad, who loves junk food, would call it McDicks Crap and would make fun of us for even asking for it. But other parents bought it at birthday parties, and once my first friend could drive, we went there for lunch during school, so even I have had my own love affair with the Chicken McNugget. When I originally decided to try to make this American favourite into its vegan counterpart I thought to myself, “Isn’t most of the flavour coming from the batter and sauce?” I was pretty convinced that it would be an easy one to recreate. In some ways it was, and in others it was not. I tried it with tofu, but it really just tasted like dipped breaded tofu, which was delicious but nothing special. After scratching my head for a few days, wondering how I could make really good vegan chicken nuggets, I recalled last christmas when I made a seitan turkey, and knew immediately that I could totally make seitan taste like chicken! And it did! Ba da ba ba ba I’m Vegan it! 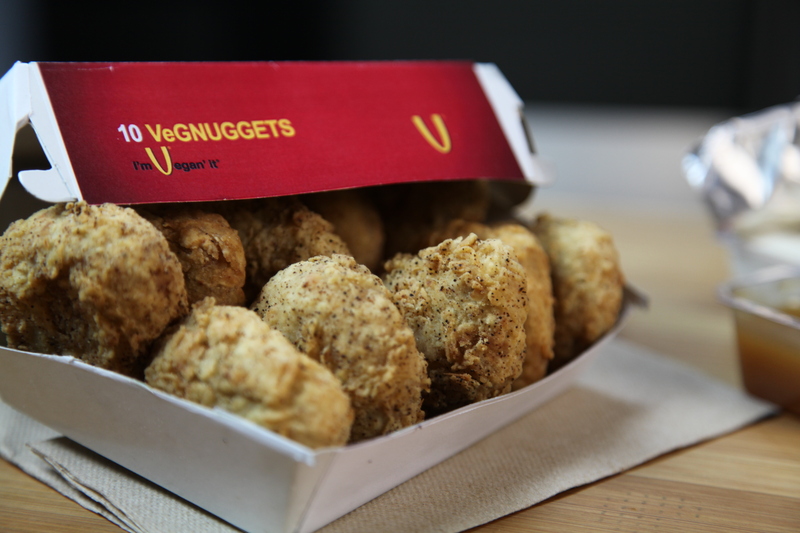 Try this Vegan Chicken McNugget Recipe out and see for yourself how you can enjoy that salty, crunchy taste without the need to harm any animals! I've tried other vegan chicken nugget recipes and they just aren't the same. In a mixing bowl, mix together wheat gluten, nutritional yeast, onion powder, salt and poultry seasoning. Divide the dough into small little nuggets. Keep in mind they will grow to about twice their size, so make then smaller then you would normally. You should have enough dough for 24. 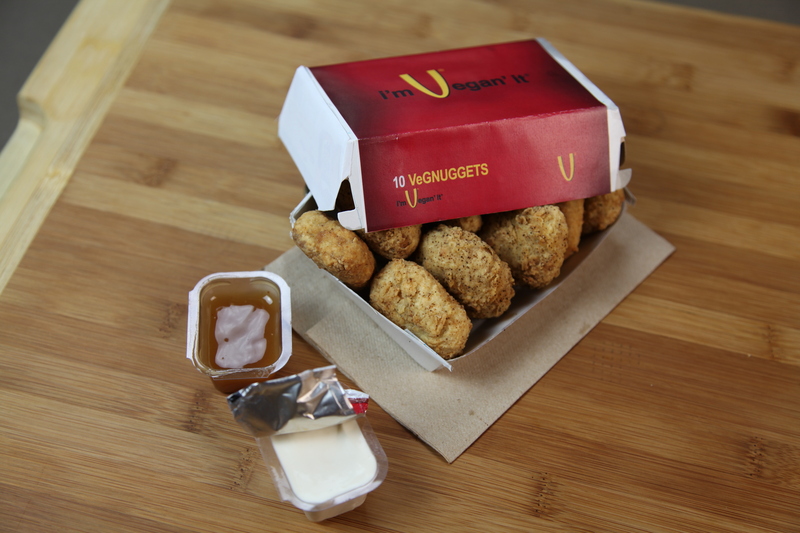 Place the nuggets in a casserole dish, with the chopped onion and cover them with remaining vegetable broth and foil. Cook nuggets in broth and onions for 1 hour in the oven at 350 degrees, flipping at 45 minutes. Place egg replacer in a small, shallow bowl. Combine the flour, tempura salt, pepper, onion powder and garlic powder in a large zip lock bag. Coat each nugget with the flour mixture by shaking in the zip lock bag. Remove and dredge each nugget in the “egg” mixture, coating well. Then return each filet to the flour/seasoning mixture. Shake to coat. Lay the nuggets on a cookie sheet lined with parchment paper and place in the freezer for half an hour. Cover and refrigerate remaining egg mixture. After freezing, repeat the “coating” process. Deep fry the nuggets in a large pot of oil at 375° for 10-12 minutes or until light brown and crispy. I have a question, I am diabetic, and want to know how low carb, it is, and what the proteins and sodium content are, we need to know this so it would be helpful to add the nutrition facts to all your recipes, thanks. Is this with Seitan too? Made these last night. I didn’t have the tempura mix or egg replacer, so I just used flour with a bit of baking soda and spices and flax egg mixture. Turned out way better than expected. It tried your recipe for basic Seitan too and that was awesome! Thanks for the great recipes!! sure! It’s a batter mix you can buy at the grocery store. It’s used in many asian dishes. Is there a way to bake these? Have you ever tried baking these or storing them in the freezer more long-term? Just use normal flour 🙂 It will be just as yummy! i feel like u left out some ingredients in the instructions and left out some instructions that u did in ur video but didnt write in this recipe. i dont think i added some ingredients bc u didnt list in in the description. im disappointed. Hi Manpreet, I just took a look at the recipe and it is in fact correct. I’m sorry it didn’t work for you. You left out the garlic powder that should be added to the broth and onions. What type of oil do you use to fry them? Would love to make these without deep frying, as I’m watching my fat. Can lightly sautee instead, or even better, bake these for a similar product? haven’t tried it- but it’s worth a try! I don’t see why I wouldn’t work. Any success with baking rather than deep frying? Thanks! fried > baked, but I’d be perfectly happy with the baked ones. My suggestion is to put them on a rack on your baking sheet so they crisp all over and give them a spritz of oil or cooking spray. Enjoy! what temperature did you bake them at? What temp and for how long did you bake them for? I can’t wait to make these… I wonder if it would work in an air fryer? Just tried this. Cooked in my air fryer at 375 for 15 minutes. Brushed olive oil before “frying”. Still came out a little dry. Otherwise, really good. Anyone else try this? Hi! do you cook them in the oven? do you cover the casserole dish with tin foil or let the broth evaporate? Love this recipe-what would make it even better would be if you included a recipe for vegan hot mustard sauce to dip them in-I miss that from my pre-veggie days!! ooooooh maybe i’ll try to re-create that! Can’t wait to try this! The only thing that would make this better would be if you included a recipe for their hot mustard sauce-I still miss that from my pre-veggie days! The ingredients list 1 chopped onion but it is never added in the instructions, at what point do you use the chopped onion ? Hi Billy, the seitan is cooked in broth and onions. Bon Appetit! Hey, Do you happen to have by any chance the nutritional values of this recipe ? Hi Edgy Veg! My Name is Jette Simonetti and I am a 17-year-old interning at a spice company. I was considering attempting this recipe with a blend of yeasts and salts in order to obtain a “chicken” flavor. I was wondering what the process of boiling the pieces did. Was this purpose to infuse the dough with the aromatics of the broth? Or were you moistening the dough mixture? Was it perhaps a mixture of both?